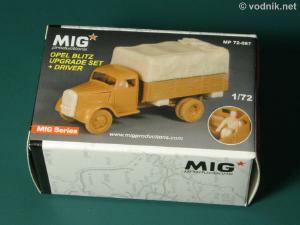 Small set from MIG Productions is designed for old ESCI 1/72 scale Open Blitz kit, re-released recently by Italeri. In the set we get a few parts to improve the truck model and also a seated figure of the driver. The set is packed in a small box with a label on it, showing the assembled, but not painted model with resin parts attached. Inside the box is a single plastic zip-bag with parts inside and some styrofoam chips to protect parts from damage. No instruction sheet is provided, but photos on box label should be enough to find correct placement of all parts. 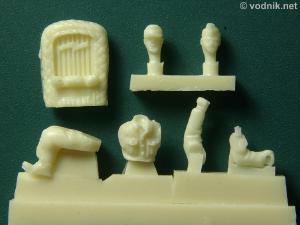 - five piece driver figure with separate legs, torso, arms and two optional heads - one in a cap and the other in a sidecap. Click on picture to enlarge it. Close-up of figure parts and engine grille. Tarps, tool boxes and one of the benches. 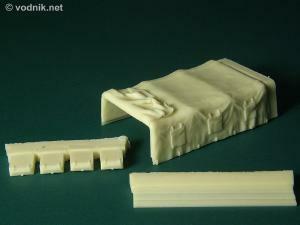 I don't have ESCI / Italeri kit, so I cannot comment on the fit of the tarp part to the kit cargo bed. Bud I've found several photos of the assembled original kit and it is immediately obvious that resin part is far superior in terms of realistic shape and accuracy. The back cover of the tarp is molded open and folded over the top of the tarp. There are six flaps molded on sides of the tarp. New engine grille part is nicely detailed with winter cover on it, but with its front flap rolled down. 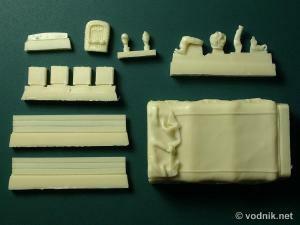 On the dashboard marked are some instrument faces and glove box cover - adequate details for this scale. The seated driver figure is well sculpted with nice and crisp details and quite good facial features (for the 1/72 scale). There are just two small air bubbles on parts in the set I received and no flash. Air bubble holes are in places where they are very easy to fill. Resin pouring blocks are relatively small and should not be difficult to remove, as the area of contact of each block with actual part was kept to minimum. 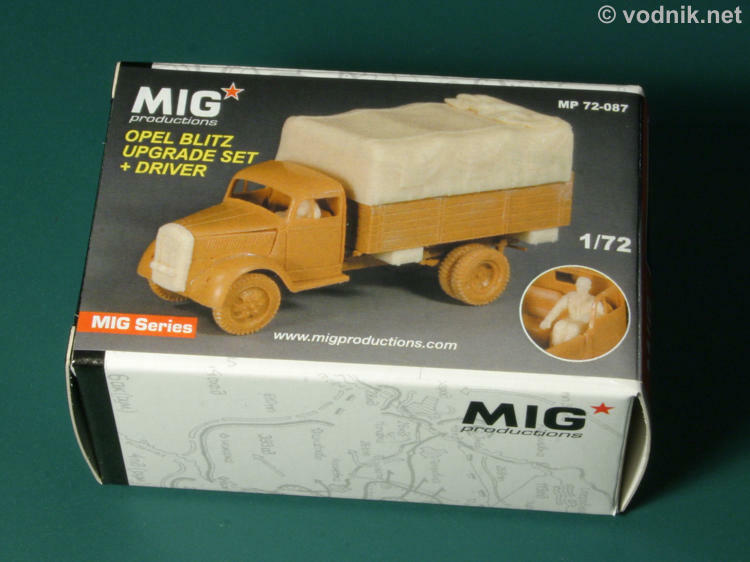 Nicely sculpted and realistic tarp is enough to make the MIG Production set worthwhile addition to ESCI / Italeri Opel Blitz kit and other included parts only increase its value. Highly recommended!